Sometimes it’s hard being a Hokie football fan – like during the 2014 season, and when I was a student. This past fall, Virginia Tech played Ohio State early on in the season, and I was nervous. Many of our friends went to Columbus to watch the game. Bill and I didn’t. I refused to go – I don’t like train wrecks. But then, a funny thing happened. We played well. I mean, really well. We played #8 OSU like we were a top ten team. Not only did our brand new quarterback look amazing, but so did the rest of the team. And we won. We didn’t just win. We dominated. Ohio State went on to win out the rest of their season, and win the first ever National Championship Game last night, beating Oregon. National champs – that’s got a nice ring to it, and their fans must be ecstatic. 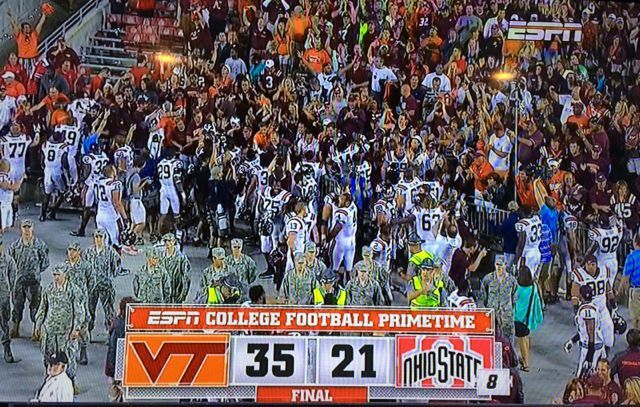 The Hokies, on the other hand, imploded after that game. We lost to teams that we used to assume were gimmes. We almost broke our double-decade-long streaks of not being shut out in Lane Stadium, and of not making a bowl game. At the end of the season, we broke even with 6 wins and 6 loses. Winning our bowl game put us at 7 and 6…..
And there is – always next year. We’ll buy our tickets with the same anticipation a child has when he tells Santa what he wants for Christmas. We’ll plan our tailgate food and drinks for that first game of the 2105 season to perfection as if we’re planning for our own national championship game. With fireworks exploding overhead, we’ll jump to Enter Sandman as the Hokies run onto the field on Labor Day evening with more enthusiasm than Lane Stadium has ever seen. It will be a thing of beauty. And just as we finish jumping, the Ohio State football team will run onto Worsham Field in Lane Stadium’s southeast corner. That’s right, our season opener is ESPN’s Labor Day Monday primetime game – Virginia Tech versus Ohio State. Yes, the Hokies were the only team to beat this year’s national champions; but wouldn’t it be even better to beat the reigning national champions, and then go on to have a stellar 2015 season? A girl can dream….. And her team can make it a reality. Did you watch the national championship game last night? Have you ever been to the Super Bowl or one of the big college bowl games? Yep, I watched the game (till I went to bed in the 2nd half). We’ve never been to one of the big bowl games – maybe one day! We haven’t been to one of the big bowl games, but we always go see the Hokies play in FedEx Field (Redskins’ stadium), whenever they play there. So far we are 0 and 3, although USC was stripped of its 2004 BCS title (we lost to them early that year at FedEx Field), so does that mean it goes on the books as a win or non-game for us…..
Jim was a Red Sox fan from childhood, and he well understood the beauty of “next year!” Your team will make you proud next year, I can feel it! Big Ravens fan, here, so I’m definitely in that “there’s always next year” place right now. It’s tough to wait it out, though, isn’t it? I was cheering for the Ravens last weekend, too. I didn’t, but from all accounts it was incredible! I have never been a big fan of college football (I went to a school that lacked big time in sports), but I’ve got to admit that the excitement has been pretty contagious! Salt recently posted…A little facelift! I went to a college that didn’t have a football team. But my son is very into college football, and the NFL. He watched the championships, and we watched our Ravens end their season last weekend. If they had made it to the Superbowl, my husband would have been there in a second. Maybe next year! Then your husband is my idol!